If his cowboy boots are any indication, Ben Brown has been covering a lot of ground as he gets to know the Ohio farming community. His brown Ariat boots are generally flecked with mud and dirt. Since becoming manager of The Ohio State University’s Farm Management Program in September 2017, the agricultural economist has visited 62 of Ohio’s 88 counties—some of them multiple times. This would explain why he’s on his third pair of boots since moving to the Buckeye State. A slim redhead who will soon celebrate his 26th birthday, Brown looks years younger and is used to still being carded by those who doubt his age. “I’m fighting off a cold and was just carded when I bought NyQuil,” he laughed. Brown admits that his youthful appearance has been both an advantage and disadvantage. While younger farmers immediately relate to him, older farmers can be more skeptical until he opens his mouth and starts explaining the complexities of the futures market, the farm bill, tariffs, and complicated dairy programs. Brown is approachable, always has a smile on his face, can talk to anyone, and is developing a program to help Ohioans mitigate risk and stay in the agricultural industry. He’s got just the right dose of humility to know he’s not an expert in everything, but he is always eager to learn. 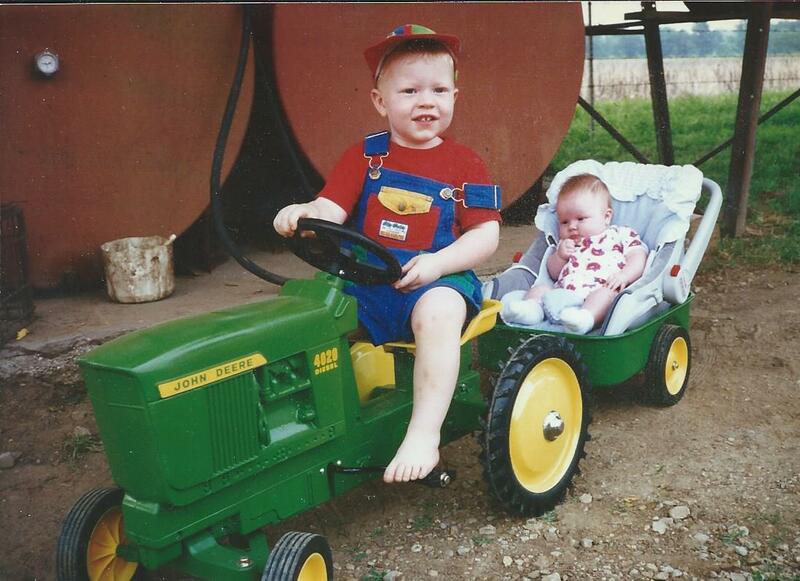 Big brother Ben uses his John Deere pedal tractor to take baby sister Rachel for a spin around their Missouri farm (Photo courtesy of the Ben Brown). Raised on a farm in western Missouri, he and his younger sister, Rachel, worked alongside their parents growing wheat, corn, and soybeans, and raising cattle. He won numerous awards in 4-H and the National FFA Organization, including the Missouri Soybean Speech competition, which helps explain his gift of gab. The Brown siblings showed steers at the county fair which, coupled with sales from Ben’s FFA-supervised agricultural experience project, helped cover some of his college expenses. Brown became enamored with the land-grant extension model while studying as a graduate student at the University of Missouri’s Food and Agricultural Policy Research Institute. There, he experienced firsthand the impact that information, research, and planning can have on an operation’s success. 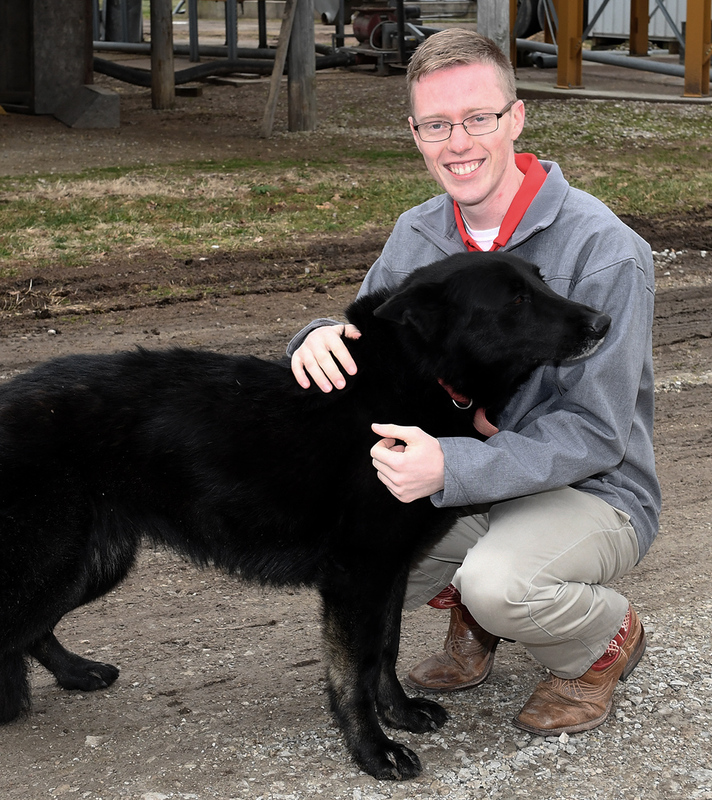 This experience also informed his approach to building Ohio State’s Farm Management Program at the College of Food, Agricultural, and Environmental Sciences (CFAES). Having grown up on a farm, Brown knows how inherently risky farming can be, in part because of the large cash flows from revenue and expenses, along with the sizable amount of capital required to run an operation. “As a farmer, you are putting all your eggs in one basket,” Brown said. That basket can be one year’s production for row crop farmers and an even longer and varied time frame for livestock producers, he said. Many farmers in Ohio and across the country are now facing even more stress due to the declining farm economy as a result of low corn, soybean, and livestock prices. So Brown’s top goal is ensuring that farmers have the right tools to make the many tough decisions they need to make. He also wants them to understand that they have options. According to Brown, there are factors in Ohio that make managing a farm a little different. The high cost of land in the eastern Corn Belt compared to the western part requires a higher cash flow to get started in farming—a challenge for young people with little financial capital. Figuring out how to help those returning to their family farms or those trying to enter the industry is one of the biggest challenges currently and on the horizon. For now, Brown is putting effort into helping those already in the industry stay profitable in order to remain there. He now distributes a monthly grain-marketing outlook that recaps where supply and demand sit and their relation to prices in the country and the world. Farmers can use the data to inform their grain-marketing decisions. Brown shares some market forecast models with Pickaway County grain farmer Scott Metzger. 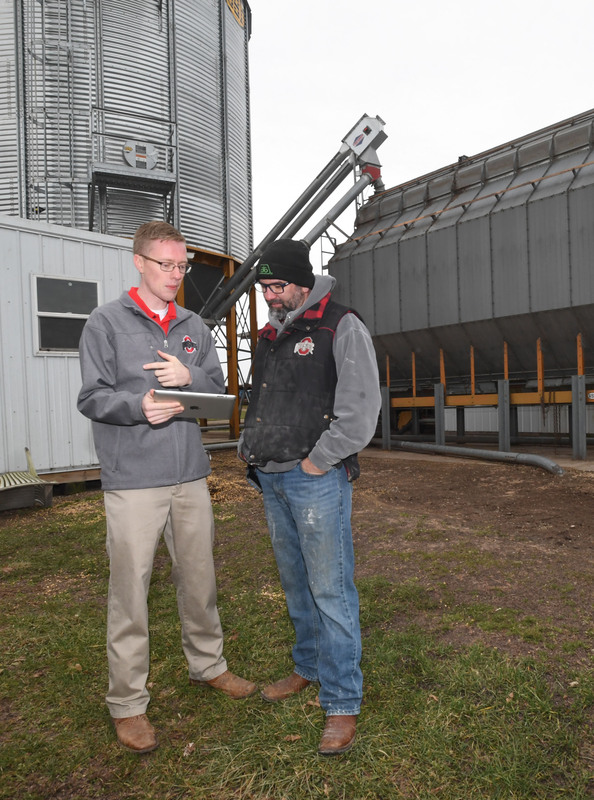 Ohio State University Extension educator Rory Lewandowski credits the Farm Management Program with providing basic economic production information that is vital for farmers to run a successful operation. The program offers information on understanding balance sheets, income statements, cash flow, working capital, financial ratios, and how to take information and translate it into sound decisions. Brown helps teach farmers how to use Agricultural Risk Coverage and Price Loss Coverage programs, both of which provide federal payments to farmers, assisting with farm-level cash flow. “Farmers can plug in numbers based on their scenarios and see which program is the best fit for their operation,” Lewandowski, of Wayne County, said. Brown has also collaborated with the Ohio Farm Business Analysis team led by Dianne Shoemaker, an OSU Extension dairy production economist. The team helps farmers compute production costs, enabling the farmers to know where they are strong and/or weak compared to their peers. Brown’s passion is apparent, which is why people are generally receptive to what he has to say and why he’s been asked to serve on numerous Ohio agricultural advisory boards, including serving as secretary of the Top Farmers of Ohio, a group comprising 100 of the largest farms in the state. Farmers throughout the state agree and appreciate Brown’s determination. Having help with identifying and understanding trends in agriculture is critical right now, said Fred Yoder, a Union County farmer for nearly 40 years and owner of Yoder Ag Services, an Ohio-based seed company. 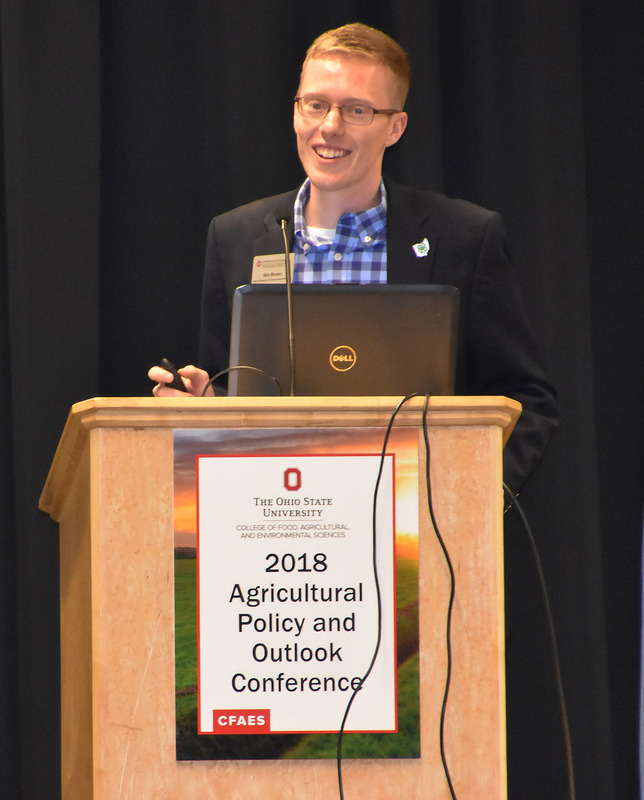 Brown was a featured speaker at the most recent Agricultural Policy and Outlook Conference at Ohio State. He is also part of the team of agricultural economists who offer winter outlook meetings around the state. In county meetings across the state, Brown presents his projections on commodity prices and helps farm owners analyze their operations through the lens of a business model. As he continues to make his way across the state, he is developing plans for tackling even more challenges. For example, Brown is always thinking about how to help students in the CFAES Department of Agricultural, Environmental, and Development Economics (AEDE). Many AEDE students lack prior agricultural experiences or do not come from a background in agriculture. Brown is building an internship program with producers around Ohio willing to work with those students during the summer. Because internships are crucial to student success in the industry, the Farm Management Program will allow students to gain hands-on work experience while creating a business management plan that applies information learned in the classroom to a particular operation. Farmers can help design the project, ensuring that they get needed help with an aspect of their business operation. For example, Brown worked with AEDE major Anna Gerten on a farm management project related to risk and cash flow. A December 2018 graduate, Gerten is now working as an OSU Extension educator in Putnam County. Haylee Zwick, another December 2018 graduate, conducted research, met with producers, and answered their questions about the new Market Facilitation Program, which is the U.S. Department of Agriculture’s response to low commodity prices from tariffs and other pressures. She is now working for the Archer Daniels Midland Company, an Illinois-based agricultural processor and food ingredient provider. 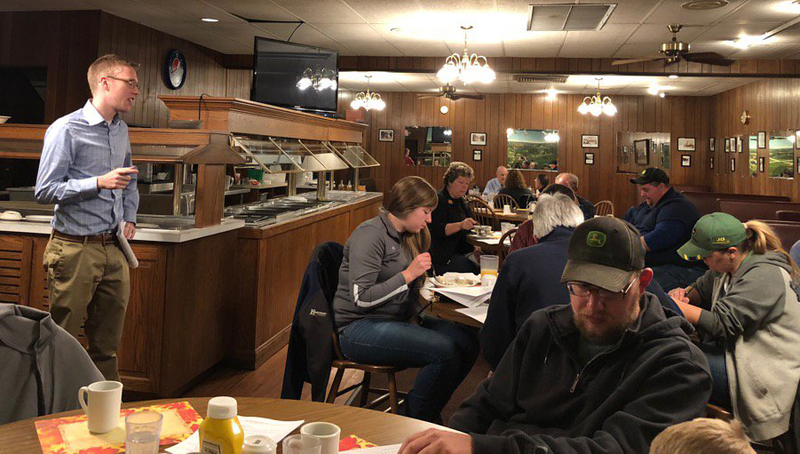 Many of Brown's farmer programs, like this Coshocton County Ag Breakfast, involve food so he has become well versed on the various foods served in Ohio (Photo by David Marrison). This spring, Brown will be working with OSU Extension educators on developing a farm bill training program to help farmers understand the nuances of the upcoming farm bill in order to make sound decisions. “This is my first go-round for some programs, and I am learning as I go, too,” Brown said. Not all of Brown’s time is focused on Ohio agriculture production. He also has been educating himself about some of the various foods served in Ohio. Before launching into a series of graphs and key points at his educational farmer programs, he often shows a series of photos detailing his food tour of the state. He’s discovered that Hirsch Fruit Farm in Chillicothe has a delicious apple cider slushy and that Warsaw, Ohio, is home to his favorite hot beef sandwich. Brown also spends time volunteering at the Central Ohio Ronald McDonald House in Columbus, Ohio, a charity that means a lot to Brown and his family, as they saw firsthand the value of the facility when a family member's daughter was born several months premature. Once a month he cooks meals and plays games with residents navigating the intense stress of managing a child’s illness. He also admires the charity work of Dolly Parton, whom he met at the Dixie Stampede in Branson, Missouri, when he was four years old. “My grandmother even invited her to my birthday party,” he laughed. Although she didn’t make it to his party, he admires everything Parton has done for her rural Appalachian community of Sevier County, Tennessee. Along with opening up a theme park, Dollywood, that employs a lot of local people, she created the Imagination Library as a tribute to her father who never learned to read. The “library” now gives a book a month to well over 1 million children. After the Great Smoky Mountain wildfires in 2016, Parton pledged $1,000 a month for six months to families left homeless by those fires. It’s safe to say that Brown is already having a positive impact on his new “community.” He has quickly become a familiar face and a valued asset to Ohio agricultural producers who are hoping he won’t leave the state anytime soon. One promising sign is that he has transitioned his Ariat boot tops from his favorite color of green to the more appropriate Buckeye scarlet! Wearing his Buckeye-inspired Ariat footwear, Brown greets the farm dog on the Metzger farm - a frequent perk of his farm visits.